If you ever view Facebook, a few months ago there was a continuous stream of debate about the merits of various bands and artists asking the question “Is It Prog?”, and in many cases it was usually people’s own perceptions that set the boundaries of their views, in some cases anything other than the big six (Yes, Genesis, ELP, King Crimson, VdGG and Tull) was out. This is not a view I ascribe to, and whilst I love the works made by those trailblazers, I still feel that there is much room within the genre for new artists and further experimentation. 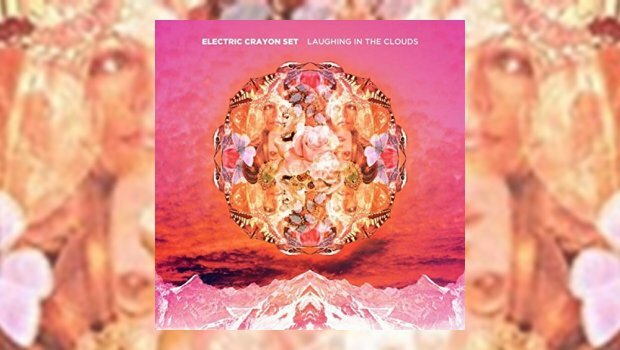 No one really wants to hear old ideas rehashed and dressed up as something new, which leads me to this latest album, Laughing In The Clouds, from Electric Crayon Set, an album which isn’t really prog per se but certainly has much merit and is well worth a listen. I know very little about this band apart from that they are Finnish, this is their third album and the second to be issued via my friend Pete Bonner’s Psychotron Records label, on vinyl and in a lively blue colour too. The little info I can glean suggests that they are heavily influenced by The Small Faces and ’60s psychedelia in general, all of which makes for some interesting songs, indeed the opener Pete is Laughing in the Clouds is simply fantastic, very catchy and springy with some real drive to proceedings, Seppo Tyni laying down a brief but well executed solo on this track. This is a very happy song that descends into mad laughter at the end and is insanely catchy. It really deserves a wide audience. It is then swiftly followed by Dreams of the Rain, which I feel has a Beatles vibe to it, and also has another great guitar break from Seppo. There’s a somewhat epic chorus and refrain that stays in your memory, another class track, the many years the band took recording this album have been well worth it as their efforts and the results are outstanding. Calling on the Cards features Vilma Pääkkö and she has a sweet, slightly mournful voice that is clear and distinct, again another strong chorus line making this song memorable. Ignis Fatuus is another great piece with a further fine guitar outburst from Seppo and some good keyboard noodling from Timo Pääkkö, then it’s on to the last song on side one of the vinyl, Where Are We? The second side of the album again opens in strong form with a storming song called Isthisthewayyoufeelthatyouwantmetofeel?, which has a corny synth sound to open but powers on through with another great guitar break from either Sekko or Timo. A long song title but an interesting song nonetheless, it’s followed by Back to the Space-age with another strong melody and chorus, very late sixties sounding indeed. The intriguingly titled Music to Watch Accrington Stanley By follows, another corker, very catchy and memorable indeed with great vocals and sound, a nice guitar tone and effects making it sound very clean with an effective mid-song breakdown. Very nice indeed. This album certainly makes a positive impression with its suite of strong songs and top-notch performances alongside its memorable melodies. After the Show follows, a moodier piece with a down, almost morose sound amidst its synth and guitar lines, but still impressive with its spoken part sounding especially effective. The last two songs, Moonlit Graveyard Parts 1 & 2 run together in one continuous track, opening with acoustic guitar and voice with a strong vocal line that runs throughout as the song tells of a walk through the titular graveyard, told through stories never told, with strong imagery in the lyric and handled in a sympathetic manner, before the weird and discordant funeral march of Part 2 is ushered in, this is the most psychedelic track of the album and is a worthy closing piece to a great and interesting album. Yes, it’s slightly off kilter but all the better for it and hearing it is good for you, well I thought so at least. A great album and one that will appeal to fans of the likes of early Pink Floyd and psychedelic rock styles.